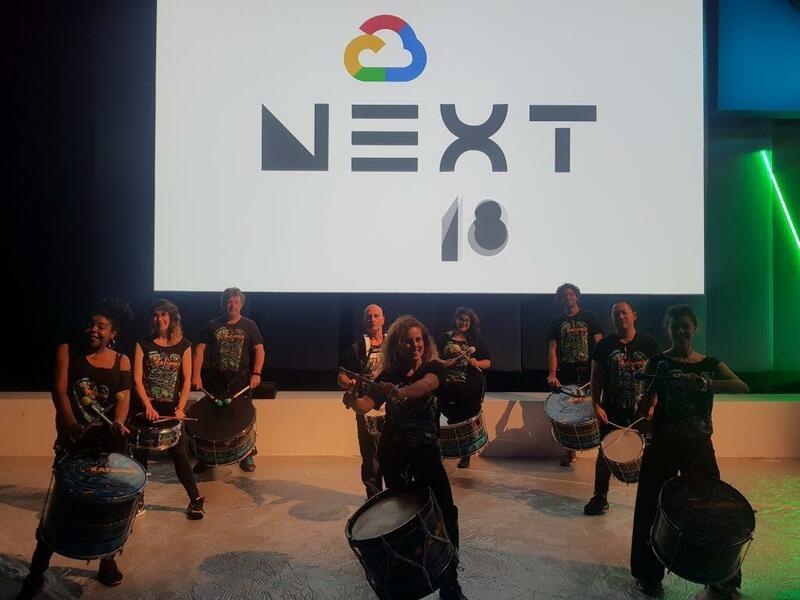 Women leaders and women drummers at our biggest gig to date - drumming for Google's Cloud Next 2018 conference down in London! Never did we think it would be Google! Arriving at Excel conference centre in London early Monday afternoon, our band spent the rest of the day rehearsing to precise cues of voiceovers and videos. These digital installations were to interweave with our drumming band’s performance – without a glitch. This was for Google, after all! After a nervous night sleep, suddenly it was Tuesday, performance day! Ready and raring to go by 8am (!!! ), Katumba costume was merged with Google visuals as our drummers fashioned the Google Next logo on their cheeks. And of course our usual generous sprinkling of eco-friendly glitter! 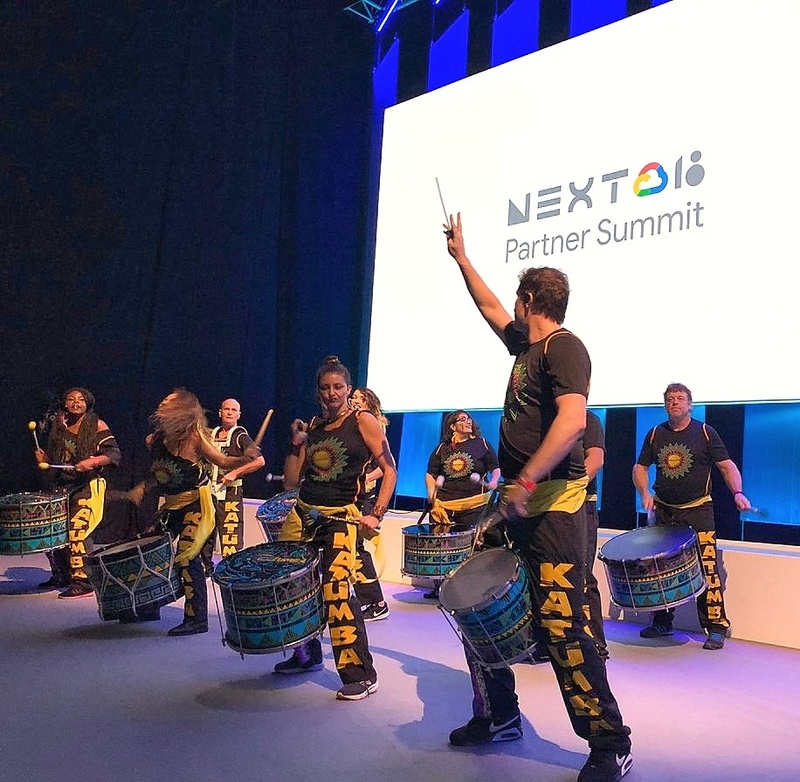 Our energetic drumming band opened the conference to unsuspecting spectators, who – after an initial shock – enjoyed our early morning blend of samba reggae, big beat and upbeat moves. Sebastien Marotte, Vice President Google Cloud. 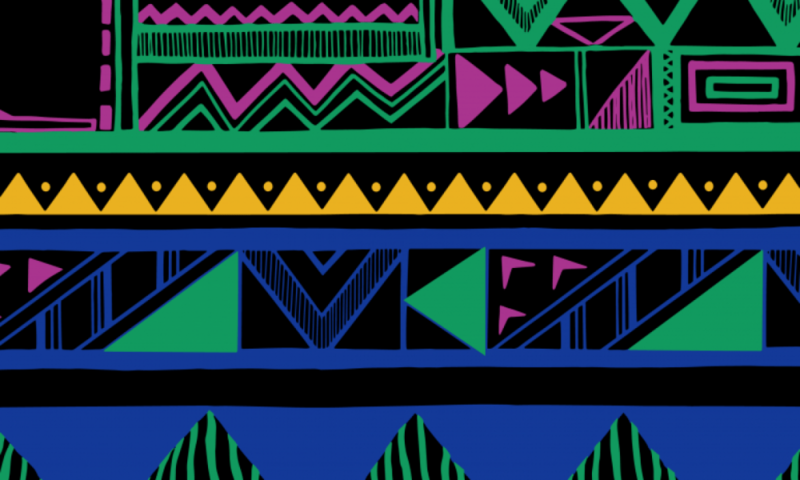 It was particularly amazing to see so many women in leadership roles at Google. Google in fact has the most gender equality out of any other top corporate tech company’s executive team. 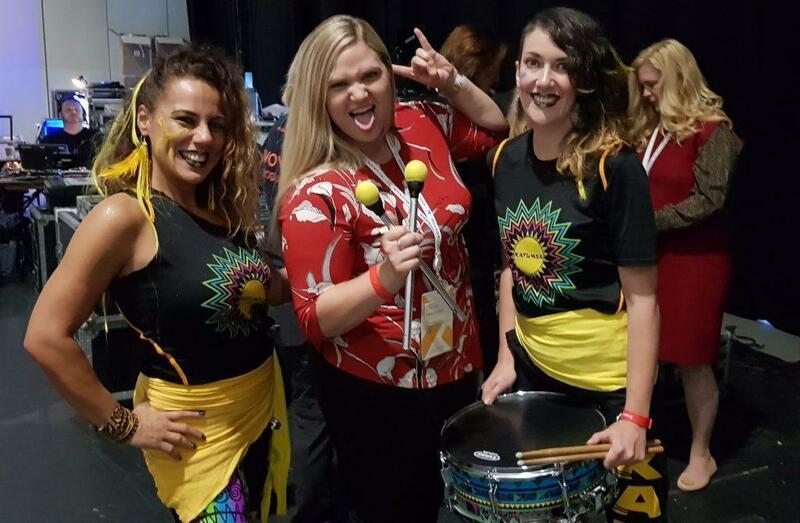 Katumba champions women empowerment through our mass of drummers – most of which are women – and the presence of our powerful female performers at the conference was a great complement to Google’s women leaders. So much so, that some of them wanted to join us! What an experience! Not only was this the biggest gig in Katumba history, but it was a huge challenge for our Band Leader Ritchie who was working within the timings of digital media at an unbelievably high profile event! So much could’ve gone go wrong but he absolutely smashed it – as did all the drummers who played. We want to say a big thank you to Google (who funnily enough – googled us!) for giving us this incredible opportunity, and Wonder London for making it happen – particularly Harry, who was an amazing colleague, friend and brilliant communicator over the 22 hours at Excel. Big shout out to Virgin Trains for halting that train’s departure to help us get our huge swaithe of drums stored and secure on the train journeys to and from London, at very (very!) short notice. 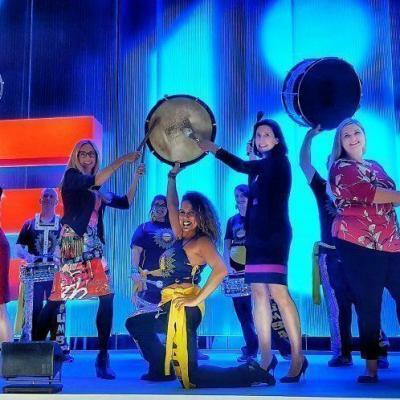 If you have a conference event coming up and are looking for a unique and memorable performance or corporate workshop, please email us at katumbadrumming@gmail.com or call 07791612905. We’d love to hear from you!